In a dorm kitchen with no appliances, it’s not only hard to be imaginative with new recipes; it’s often tough to recreate simple favorites that require a stove, oven, or other staple appliance from your kitchen at home. But before you start planning an impromptu visit home because you miss your pots and pans, consider another solution: buy a George Foreman grill. Like the dorm microfridge or the spork, a George Foreman grill is one of those genius all-in-one inventions that you don’t know you need until it solves all of your problems. The title calls it a “grill,” but these babies can act as an oven, stovetop, or toaster in one simple device. Best of all, they come in all sizes (and prices) to accommodate your life; freshman year, I had a small one that was perfect for single-serving meals, and now, my family-size version accommodates mine and my roommates’ appetites. Living without a stove freshman year, my George Foreman was my go-to tool to make a quick hommeade dinner. A grilled chicken breast and veggies take mere minutes to cook, and you can spice them up enough different ways so it never gets old. A personal favorite: fajitas! So it’s snowing outside and your dorm doesn’t have a lawn? Or you have no idea how to use a grill because, let’s be honest, charcoal is more complicated than it looks? Throw a BBQ anyway — in your kitchen. 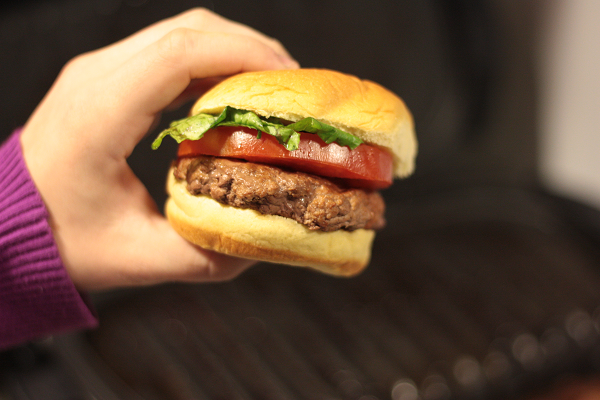 The indoor grill is perfect for burgers (and french fries! ), and a bonus: George Foremans are designed to drain fats from your food, so by the time the weather’s ready for an outdoor party, your abs will be too. Want to make fancy sandwich-shop style sandwiches in the comfort of your own home? Instead of spending extra cash on a toaster oven or panini press to make deliciously complex sandwiches, pop them on the grill for a few minutes instead. You’ll get crispy, golden brown results without the extra expense (or waiting in line). Cut chicken into strips and marinate with fajita seasoning in a plastic bag. Preheat the George Foreman grill until the indicator light turns off, and cook the strips for 6-8 minutes or until cooked through. Coat peppers and onions with olive oil and grill for 5 minutes or until done. Line a tortilla with strips, cheese, salsa, peppers, and onions — be careful not to overfill! Fold in half and place on grill, making sure the open side is facing up so the fillings don’t run down the incline. Cook 3-5 minutes until slightly browned, and serve with sour cream. In a large bowl, mix together the beef, yellow onion, garlic, salt, and pepper and form the mixture into 6 patties. Preheat the George Foreman grill until indicator light turns off, and grill for 6-8 minutes until cooked through. If making cheeseburgers, place a slice of cheese on top of each hamburger during the last 3 minutes of cooking. Serve the hamburgers on the buns with tomato, white onion, lettuce, dill pickle and condiments. To make fries, sprinkle sliced potato wedges with salt and grill for 27-30 minutes, or until crispy. Pre-heat George Foreman grill until indicator light turns off. Grill bacon for 6-8 minutes until cooked through. Spread the butter or margarine on the bread, and place one piece of bread on the grill, margarine side down. Place 1-3 slices (depending on the size of the slices) of cheese, bacon strips, and tomato slices on top; then place the other slice of bread on top of the cheese, margarine side up. Grill until sandwich is nicely browned and cheese is melted. Remove from grill, cut, and serve immediately. « prev | Friday Recipe Round-up: Springtime Inspiration and Pasta Galore! All my food is done by my GF grill!